If you’re a big fan of anime, particularly the work of Goro Miyazaki, then you will find a lot to like about the new app for the iPod Touch, iPad, and iPhone called Grooh. 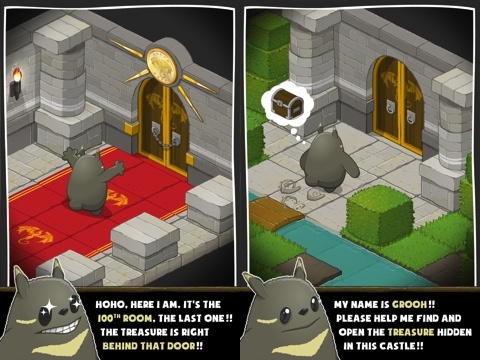 Developed by digiDingo, Grooh puts you in the furry shoes of the loveable, Totoro inspired main character, as he attempts to find the fabled treasures of the lost Feilong Castle. 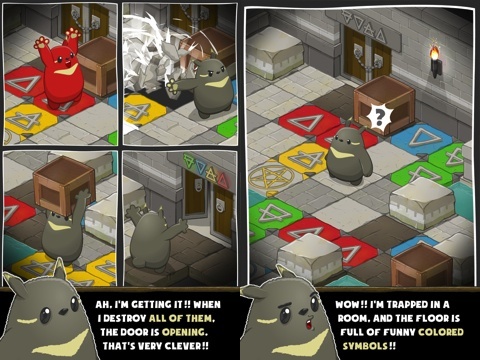 Grooh is a puzzle based title, in which the player must destroy a collection of colored tiles in each room of the castle in order to proceed to the next one. For this review, I used an iPhone 4S, and will tell you wether or not I think that Grooh is worth its $1.99 asking price. There are around 100 levels in Grooh, starting off with the basic premise of destroying a series of red, green, blue and yellow tiles that represent the 4 elements, the game soon moves onto much more complex puzzles. There are pentagram tiles that explode once touched, and a myriad of environmental traps to deal with. However, things are made slightly more accessible by the inclusion of power ups such as teleporters. The game encourages a lot of strategy and is great for people that enjoy their gameplay deliberate and thoughtful. With all this in mind, there is definitely enough content in Grooh to make it worth its price. A main issue I found whilst playing this iPhone game was that it could have been presented a lot better. Whilst the graphics are generally quite pleasant, watching Grooh move around the storybook esque levels is a delight, and the audio is equally as enjoyable, it is a shame that almost every level’s background graphics look entirely the same. This is an unfortunate choice on behalf of the developers as I feel Grooh would be much more immersive if there were a bit more variety in its artwork. It seems to me then, that as addictive as Grooh is, the application is best played only in short bursts. This will enable you to enjoy Grooh every time you play, instead of being dragged down by the repetitive feeling that marathon plays would force upon you. With that in mind, I would still recommend Grooh. A person that I feel might enjoy it more however, is an iOS gamer who is always on the go. Grooh may just be able to provide short bursts of fun for a player with a very busy schedule. AppSafari review of Grooh was written by Darius Reimm on March 5th, 2012 and categorized under App Store, Games, iPad apps, Puzzler, Universal. Page viewed 3367 times, 2 so far today. Need help on using these apps? Please read the Help Page.